Always wondered if your car insurance provider is up to scratch, or you could do better by moving your policy elsewhere? Thanks to our community, who leave their car insurance reviews with us every day - we’ve done the hard work for you. Using the power of your reviews, we’ve put together a league table of the top (and bottom-rated) car insurance companies, so you can see which companies are making their customers the happiest. (LV=) Liverpool Victoria are by far the top-rated car insurance - taking home two awards in the Insurance Choice Awards including our “Best Insurance Company”, as well as “Best Car Insurance Provider”, and now they top our car insurance league table with a fantastic score of 92.2%. Well done, LV! Also scoring highly are Aviva, Churchill, and Diamond, all of which score over 80% on customer satisfaction. Less satisfactory...you rated More Than the lowest-rated company for car insurance, with customers particularly berating their “Smart Wheels” telematics policy. Customers often vent their frustration on our site, stating the black box technology to be inaccurate, unfair and causing them higher charges. Go Girl, who won our "Worst Insurance Provider" in 2016, also score low with customers on our site. Our insight also shows that car insurance is one of the least-loved financial products out there. 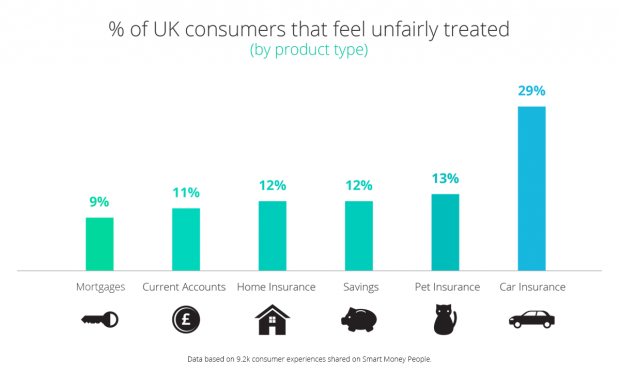 Car insurance customers tell us that they feel fairly untreated almost three times as much as current account customers do. We think this needs to change. We also looked at car insurance charges last year, as part of our CheekyCharges campaign - finding that many car insurers are charging upwards of £35 just for a straightforward name change on a policy. This frustrates customers, and in 2017, it's no longer all about getting the cheapest quote - customers demand high levels of service. So is your insurer toward the top of our league table, yet you’ve had a torrid time with them? Perhaps a claim which took too long, a poor customer service experience, or just high renewal prices. Or is your car insurance company awesome and always surpasses your expectations? Let us know and make your voice heard. Not only will you influence the league table, you’ll be helping others decide which car insurance companies are right for them. To say thank you to all of our community who leave car insurance reviews on our site, we’re giving away £25 in cash! To be in with a chance of winning, just head over to our Facebook page, like our page, and tell us who provides your car insurance, and if you think they're “great”, “terrible”, or “just OK”! Tell us whether they’re 5-stars all the way, or you'll definitely be cancelling at renewal time. We’ll share some of your best comments over the next two weeks, and choose a winner at random on 27th February on our Facebook page. Best of luck! Ts & Cs apply.